Jim McGuinness sees 12 of his side nominated for awards after their historic win over Mayo last month. Captain Michael Murphy leads the team before the start of the final. DONEGAL TOP THE list of nominees with 12 of the successful All-Ireland title-winning side in line for GAA-GPA Football All-Stars, it was revealed today. Jim McGuinness’s side claimed the county’s second-ever Sam Maguire victory with a championship decider win over Mayo at Croke Park last month. Goalkeeper Paul Durcan, defenders Eamon McGee, Neil McGee, Paddy McGrath, Karl Lacey, Anthony Thompson and Frank McGlynn are joined in the long list by midfielders Neil Gallagher and Rory Kavanagh. Forwards Mark McHugh, Colm McFadden and Michael Murphy make up the dozen. The Footballer of the Year award will also be going to the All-Ireland victors with Lacey, top-scoring McFadden and Frank McGlynn the three nominations. Beaten finalists Mayo have 10 nods while defeated semi-finalists Cork and Dublin have seven and six on the list respectively. Meath earn two nominations in Donal Keogan and Graham Reilly while Armagh, down, Kildare, Kerry, Laois and Wexford will have one representative each in a tuxedo. Goalkeepers: David Clarke (Mayo); Stephen Cluxton (Dublin); Paul Durcan (Donegal). Full Backs: Eoin Cadogan (Cork); Ger Cafferkey (Mayo); Keith Higgins (Mayo); Donal Keogan (Meath); Eamon McGee (Donegal); Neil McGee (Donegal); Paddy McGrath (Donegal); Rory O’Carroll (Dublin); Michael Shields (Cork). Half backs: Emmet Bolton (Kildare); Colm Boyle (Mayo); Adrian Flynn (Wexford); Lee Keegan (Mayo); Karl Lacey (Donegal); Frank McGlynn (Donegal); Kevin Nolan (Dublin); Michael Quinn (Longford); Anthony Thompson (Donegal). Midfielders: Neil Gallagher (Donegal); Rory Kavanagh (Donegal); Barry Moran (Mayo); Aidan O’Shea (Mayo); Brendan Quigley (Laois); Aidan Walsh (Cork). Half Forwards: Paul Barden (Longford); Alan Dillon (Mayo); Paul Flynn (Dublin); Paul Kerrigan (Cork); Michael Darragh Macauley (Dublin); Mark McHugh (Donegal); Kevin McLoughlin (Mayo); Graham Reilly (Meath); Ciarán Sheehan (Cork). Full forwards: Bernard Brogan (Dublin); Jamie Clarke (Armagh); Colm Cooper (Kerry); Conor Laverty (Down); Colm McFadden (Donegal); Andy Moran (Mayo); Michael Murphy (Donegal); Donncha O’Connor (Cork); Colm O’Neill (Cork). 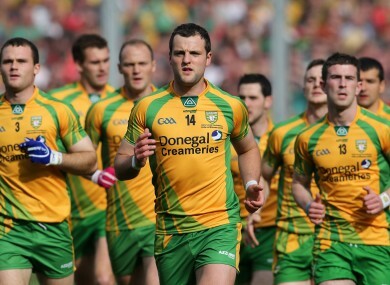 Email “Donegal lead All-Star nominations after All-Ireland-winning year”. Feedback on “Donegal lead All-Star nominations after All-Ireland-winning year”.